Mobile learning is an emerging issue. Not only is the constantly growing number of m-learning conferences evidence to this fact (Traxler 2007). Also the shift from considering gains and losses of the possibilities and options of m-learning in practice, to theory building marks the step towards the growing-up of this discipline. And last but not least are projects with mobile phones and relevance for learning which are realised inside and outside school, in work and leisure contexts implemented to an increasing degree. Such projects aim to enhance learning and teaching, reading, writing and learning skills, to support attendance, behaviour and social skills, and to counter the digital gap and social exclusion etc. – in general terms: “Research into mobile learning is the study of how the mobility of learners augmented by personal and public technology can contribute to the process of gaining new knowledge, skills and experience“ (Sharples et al. 2007). The aims in terms of research are as widespread as the ways of implementation of m-learning, the used mobile phone functions as comprehensive as the learners’ activities. The pedagogic dimension behind the aim to provide continuity for learning with focus on the learners’ experiences, cultural practices, expertise etc. from everyday life are rising from at least two dimensions: One is the demand for lifelong learning, which has an education policy dimension (see e.g. COMM/EAC 2008). Lifelong learning considers not only formal and non-formal learning, but also informal learning which refers to areas and activities which are not explicitly settled in educational contexts, but mainly the learners’ everyday life. This position is sustaining the perspective of the integration of informal learning in its broadest sense into school, but with the need to moderate this informal learning and to bring the learners to the awareness of how to productively use their patterns for their learning. Another dimension refers to the school as place which is open for informal activity patterns and agentive media use in specific situations only, e.g. during project classes. During the remaining time, the rules of the school are dominating and the activity patterns from outside school might prompt regulations and limitations, which can be precarious for learners, as Herbert Schweizer (2007) outlines. But instead of cultivating such gaps, the school’s task is to support learners in their meaning making and learning, even if it is necessary to moderate between school’s and everyday life’s perspectives, and to re-contextualise information and knowledge. Yet, this task is realised just hesitantly. In the following chapter, the question about continuity for learning is related to providing links between the learner’s cultural practices and informal learning from outside school and learning with mobile media inside school. As it will be shown, mobile phones in schools are used as tools, but their “original” use which is deriving from the pupils’ everyday life usage of mobile media is not considered very often. This depends, as it seems, on the didactic design, given by the teacher; the more education is opened towards the learners’ self-organisation and self-responsible learning, the more the usages seems to focus on situative value of the use of mobile media and the respective affordances. The mobile phones as tool for learning is, thus, sometimes used formalised and with view to a given line, sometimes it is used in rather informal terms and in accordance with situative affordances and the learner’s cultural practices. Personalised, communicative and collaborative learning as well as the learners’ expertise/practices are standing in the foreground then. As for the enhancement of learning and teaching, “attributes” describe mobile learning as “spontaneous, personal, informal, contextual, portable, ubiquitous (available everywhere) and pervasive (so integrated with daily activities that it is hardly noticed)” (Kukulska-Hulme 2005, p. 2). “Mobile learning can be […] situated; it can be […] unobtrusive […] and disruptive” (Kukulska-Hulme & Traxler 2005, p. 42), and “ambient” too (Kukulska-Hulme 2005, p. 2). It brings “advantages and drawbacks of more varied and changing locations, more immediate (‘anytime’) interaction, and smaller, often wireless devices” (Kukulska-Hulme 2005, p. 2). These attributes refer to technological characteristics of mobile devices, but they also mark a shift towards different locations for learning, as well as towards a perspective which considers the learner as being in the centre of teaching, learning and knowledge building activities. With mobile learning, which is described as “highly situated, personal, collaborative and long term; in other words, truly learner-centred learning” (Naismith et al. 2004), collaborative, personalised and learner centred learning is gaining increasingly more attention. The change in understanding learning as a communicative, interactive and meaningful activity of knowledge building (see Laurillard 2002, 2007) rather than a passive and receptive activity – from teaching to learning (Kukulska-Hulme & Traxler 2005, p. 25) – brings changes to the role of teachers and learners. Teachers are seen as providers of information and as moderators who give advice, guidance and support to pupils about how to organise learning (Kukulska-Hulme & Traxler 2005) rather than being “transmitters of knowledge” (Naismith et al. 2004, p. 36). As for learners, on whom this chapter focuses, this new gained responsibility includes opportunities as well as risks: The opportunities might refer to the integration of the learners’ agencies, their individual experiences, interests, competencies, abilities, expertise etc. in the process of knowledge building. The risk is to fail in this process – and to be responsible for the own failure. As Herbert Schweizer (2007, p. 435), a German Professor for Sociology, points out the integration of agencies and activity patterns from outside school into school structures contains risks: Spontaneous activity and interaction (informal and everyday-life related), which is raising in discursive and communicative processes of appropriation is not totally excluded from formalised organisations and institutions. However, they have to evade to informal contexts whose relation to the formal level is precarious. A consequence is a quasi-formalisation of informal activities and perspectives which has a niche character, and which will always remain in distance and discrepancy to the ‘main stage’, the formal level. (Schweizer 2007, p. 435) At this point – which marks a break between everyday life and school – the need for discursive and communicative moderation becomes relevant. It would be the teacher’s task to reduce risks for learners by acting as moderator, and to provide frames and spaces where pupils, in terms of learning, can act successfully and in the perspective of their agency, by reverting to discursive and communicative meaning making, to their experiences, preferences and strategies related to information handling and knowledge building. Ben Bachmair in this book argues that school has options to consider pupils’ cultural practices – in a wider sense their agency, activities and expertise from everyday life – for school teaching and learning, as well as cultural resources such as the mobile phone. He leans on structural aspects of Piaget’s terms “accommodation” and “assimilation” to describe teachers’ and learners’ actual and potential “reactions” on the mobile phone which are seen as genuine part of everyday life and mass communication. Envisaged is “an assimilative or accommodative adjustment of cultural practices of meaning making in the modus of learning” (Bachmair 2008) instead of exploiting them for modernisation of school or for technological innovations in the society (see Bachmair in this book). [i] Such an “assimilative or accommodative adjustment” with the aim to provide continuity for learning across contexts and “seamless transitions within and across dimensions of mobility” (Arnedillo-Sánchez 2008, p. 77) can be achieved by reverting to structures which are gained through the agentive and meaningful use of media and their different modes in everyday life as well as school: the pupils’ preferred media, modes and technologies, their usage patterns, their interests, their expertise etc. [ii] In this context, the technological aspect is considered to support cultural practices, and mobile learning is seen as communicative and collaborative interaction (Pachler 2008). This implements that mobile phones are tools for situative meaning making rather than media, which transport content and pre-defined meanings. As the technology is seen as helpful to provide continuity for learning by means of learning anytime and everywhere – in physical, conceptual, social space, “dispersed in time” (Sharples et al. 2007) – but which is first of all considered to be a tool to support cultural practices, it might be worth to have a look at how mobile phones are used in different contexts, i.e. in everyday life and in school, having in mind that continuity for learning must not only be related to dimensions such as time and space, but also to cultural practices of the people involved. To begin with and in order to introduce dynamic, ‘negotiatable’ and situative notions of the use of mobile phones definitions of context[iii] are introduced, which are crucial within the research on mobile learning and which provide useful notions for an analytical basis by referring not only to stable facts but also dynamic processes. “Mobile learning is not just about learning using portable devices, but learning across contexts” (Walker 2006, p. 2). As for the definition of “context” there exist different notions which see context either as stable and predictable or as generative and dynamic – or as a combination of both (see Dourish 2004 for a detailed outline). Cook et al., with reference to Bakardjieva (“technology-in-use-in-social-situations“; Bakardjieva 2005, p. 34), focus on the dynamic dimension, i.e. agentive and meaningful activities of learners with mobile devices in specific social situations (Cook et al. 2007). In this understanding, the appropriate agentive use of tools in specific situations is basis for the construction of contexts. Related to the question of providing continuity for learning, a dynamic understanding of context might be seen as an obstacle in gaining stability and continuity for learning between and across contexts. However, the discussion about mobile learning in schools with view to continuity for learning gives evidence to the need to understand context partly as stable and predictable, and partly as dynamic and learner generated. The cultural resources, i.e. the mobile phones as stable contexts can provide continuity in terms of locations, time, technological connectivity, contents etc. The activities as dynamic dimension are seen as link between everyday life and school, by referring to structures within this dynamic process which both ‘spheres’ (school and everyday life) have in common, which are present within the learners’ cultural practices inside and outside school, and which allow stable frames as well as the option to be negotiated situatively and in social interaction. Such structures are for instance rules. In the following sections the pupils’ proximity to rules within school contexts is explained by using the example of ICT in schools. Beneath, three examples are given which aim to show that there – within mobile learning in schools – exist rules which are agreed upon or given in advance and handled as stable as well as rules in terms of dynamic and open settings which bring forward situative, negotiated and affordance-oriented use of mobile phones in school. ‘Learner’s voice’ – rules and regulations as obstacle or as challenge? (a) Pupils attribute learning with ICT (in this case by referring to games) inside school as being serious and learning, their use outside school and during their leisure as being fun and play. However, pupils hardly see possibilities to bring these two spheres together. “Boy Like on the computer when you’re sometimes playing games you could do mathematical games or science questions and stuff like that so you can learn more when you come to school you know a little bit more about the subject. Int. So do you think that maybe there should be more games in school on the school computers? Boy I don’t think so because it might interfere with real learning. Int. So games is not real learning? (b) Further on, pupils apply the use of ICT from outside school inside the classroom to rules and regulations. The use of their preferred media inside school – which is considered by many of the pupils as making learning more fun (Cranmer et al. 2008, p. 28) is limited by themselves insofar as they would allow the regulated use in specific timeslots and situations only – whereas e.g. during the remaining time, the teacher should keep the devices to hold pupils off playing during the lessons. Such proposals might be related to the social desirability in school contexts and the pupils’ experiences with school as a culturally defined space with own rules and regulations – which include the regulation of the acceptance and use of media from outside school inside. On the other hand, pupils might have made the experience that rules and regulations include not only limitations, but might rather provide negotiated spaces of relative freedom and range in terms of their agencies, cultural practices and cultural resources (Seipold 2005). However, the pupils’ focus on gaming and their knowledge about rules and regulations as one dominating structures within their school life might provide a link between “playful” activities outside and regulated learning inside school. In both, playful activities and school, rules are basis for cultural practices. As Martin Brynskov (2007) outlines, playful activities can be described as “unstructured (ludic activity), over somewhat structured (play) to highly structured (game)” (Brynskov 2007, p. 9). But rather than taking these different kinds of playful activity as stable, he refers to “transformative social play” (ibid.) as a dynamic and discursive process in which rules are negotiated within social interaction. “Play in general can be seen as a fluid activity where children can move back and forth between unstructured playfulness and highly structured games with strict rules” (ibid., p. 8). Rules in these two examples, the British and the Danish one, are considered to be essential for the implementation and use of technologies in school contexts. Also, it might be evident that rules can either be negotiated or set in advance or be dynamically negotiated and changed during use. Rules as structures which are orientational patterns in school as well as outside are seen as linking structures between everyday life and school. In order to gain an understanding for potential regulated or dynamically negotiated use of mobile phones, two questions are central for further considerations: (1) Where are differences in the use of mobile phones in different contexts – in school and outside? And (2) at which point continuity in the use of mobile phones gets notions of discontinuity, i.e. where happens a dynamic and ‘negotiative’ use of mobile phones in schools. Since some years now, mobile media are ranging amongst the top 10 of young people’s most preferred media. Especially the mobile phone is playing a dominant role. In 2008, 96% females and 94% males between 12 and 19 years own at least one mobile phone. No other medium is owned as often as this device (figure 1), and only television and the computer are used more often in leisure (figure 2). Their favoured brands are Nokia, Siemens, Sony Ericsson, Motorola and Samsung (Bauer Media 2005, p. 16). The functionality of the mobile phones for young people ranges between entertainment (using the phone as mp3 player or playing games on the mobile phone) and regulation of emotions/interaction with others (contact to friends, expression of feelings by SMS). Also “inspiration” by means of using the mobile phone as style and prestige object or as trading platform for music, videos and pictures is an important issue for adolescents (Bauer Media 2007, p. 46). Conversation is done by synchronous voice communication as well as via asynchronous text based communication. Synchronous text based communication such as chat is not mentioned. As entertainment media, the audio and audio-visual media music and games are used, as well as mobile TV; watching films or videos on the other hand is not mentioned. The production of entertainment or documentary formats however refers to the visual dominated picture taking and video recording rather than sound recording or production. Data exchange is related to the distribution of contents and assumable to archiving. The mobile phone might then be used as (transit) data storage. The dimension of organisation which appeared yet in 2007 with reference to the clock function is not mentioned anymore in 2008. Communication is for the 12-19 year olds central as is entertainment. Up- and download of data and P2P are practiced by engaging in communication, entertainment and information retrieval. Conversation is text based by using different formats. Synchronous and asynchronous tools are used as well as formats which feature either short length and specified language (such as chat language) or the more formalised letter. Voice based communication as an equivalent to telephone conversation is not used very often. Entertainment ranges from listening to music, sounds and web radio over watching films, videos and web TV, to gaming. Young people are the receivers/consumers of these formats and rarely providers of e.g. podcasts. Young people retrieve information rather than produce information; information are either accessed via web pages, search engines, Wikipedia or received via news tickers and newsgroups; only a few make written contributions to newsgroups and Weblogs. Commerce is related to buying something on the internet. Music, film and video download is assumable done with the purpose of storing music, to build a repository, a data base or an archive. Social networking is practiced by more than 50% of the 12-19 year olds. Related to the internet use, communication, participation and negotiation seem to be central activities for the 12-19 year olds – besides activities which can be characterised as entertainment. As there is a broad range of the use of mobile phones and the internet in the lives of the 12-19 year olds, the question is if they are also used in school in the same way or if there might be differences. At a first glance, the following results can be drawn: The mobile phones’ functions which are related to conversation, and also negotiation and participation) – telephone, SMS, social networking – are, compared to other functions, used most often in everyday life. In schools, and related to mobile learning, the conversation functions often backs out. This applies to spoken as well as to written communication. Furthermore, tools for data collection and distribution are standing in the foreground, namely the camera (for taking pictures and videos) as well as functions which allow connectivity for distribution of contents. The convergent medium is the platform/Weblog which is used as place to store and archive information and material for documentary purposes or later recall. The following examples are basing on different didactic[vi] concepts. They aim to show how the use of mobile phones for learning in schools ranges from their use for the purpose of information transport to their situative use and according to specific affordances, including practices from everyday life. The mobile moodle experience[viii] is part of an m-learning project which was realised in an Austrian Hauptschule within Physics lesson. Pupils from a 4th grade (year 8, 14 year olds) participated in this project in the summer semester 2007. Aim of this part of the project was to test if the technology, which is used for mobile enhanced learning, is working properly, i.e. to evaluate the connectivity and upload between the mobile phones and a moodle platform. The 11 mobile devices (Nokia N71) which were used by the pupils were borrowed from Nokia for a limited period of time. They had to be returned at the end of the project. The moodle platform and a Java software which was installed on the mobile phones allowed students to upload their data – images, videos and text messages – which they had taken from their experiments in Physics immediately, and without cost from the mobile phone to the platform. The teacher provided basic data and assignments on the moodle platform in advance. The added didactic value was in providing pupils a platform to store their observations, and thereby to make short but complex experiments available long term, i.e. to overcome ephemerality and make the material available for analysis and reflection. Thus pupils would be able to refer to and access their recordings and results again later for further discussion and descriptions (Schittelkopf & nischiTV 2007). The use of mobile phones within the “momo” project applies to functions for communication, production, distribution and archiving: text messages, images, videos and an upload possibility to a platform. The conversation function text message is in the context of the classroom used to specify the uploaded content (figure 7). The use of the record functions images and videos are used to provide objective and comparable evidences and material for later recall. The convergent medium, a forum on a moodle platform, is used to store material in a repository/archive for later recall. All media and functions are used for documentation and storage purposes. Other functions of the mobile phone as well as of the convergent medium platform are excluded, including their functionalities in everyday life which might be first of all conversation and information retrieval. The “Handy” project was realised by a teacher in a Swiss private secondary school with a specialism in sports. The mobile phone was used as learning tool as well as a topic of inquiry. The aim of the project was to inform and to support pupils about and in the use of their mobile phones. This included not only to make students aware of the expenses or other risks they might incur by using their mobile phones[x]; the teacher also intended to show them how mobile phones can be used in school contexts and thus for learning, as well as for broaching the issue of formal aspects of telephone conversations (e.g. with view to applying for jobs or to communicate in formalised environments) (Deubelbeiss 2007). For the practical part of this project the pupils used their own mobile phones. There was no external financial, technical or other infrastructural support – except for the engagement of the project coordinator. Pupils were asked to work on a topic in German, French or Mathematics with a view to producing ‘microcontents’[xi]. Pupils were free to choose the school subject, as well as the media format (film, picture, sound or text); for the project coordinator, it was more important that pupils solve a task and produce ‘microcontent’ in keeping with curricular aims and objectives. According to the project coordinator, some of the pictures which were used by the pupils were already available on their phones, and thus not produced explicitly for the exercise (see e.g. the Syntax example below). Other pictures were taken from the text book (see e.g. the examples from Maths and French below). The ‘microcontent’ in the form of MMS (Multimedia Messaging Service) was saved as draft and distributed via Bluetooth to the project coordinator’s mobile phone. As for the text based pieces, he revised language and orthography, and uploaded the small units with his mobile phone to a public Weblog at his own expense. The use of mobile phones also within the “Handy” project applies to functions for communication, production, distribution and archiving: text messages, images, videos and an upload possibility to a platform. The conversation function text message is used to produce text as integral part of a multimodal assignment (“Syntax”) and to write headlines (“M. est plus grand que”). The record functions images and sounds are also used either as an integral part of an assignment (“Path-time diagram”), to provide additional information (“M. est plus grand que”), or as reference to the original context of the assignment (“Syntax”). The convergent medium internet is used by means of a public Weblog, pushing the archiving function in the foreground by using the Weblog to store learning material. In terms of the use of text, instruction and information are standing in the centre. Conversation in terms of a discursive and negotiating activity does not seem to be a central issue. According to the non-use of text as a respondent activity, but for his instructive character additional and framing information are in some of the examples provided by other modes, i.e. sound and images. 331 pupils from 3 different schools and different levels of education (Level A, year 9, year 10-11 and year 11) participated in this project in 2006 and/or 2007. Pupils in school A used their own mobile phones, pupils in school B used their own sim cards in provided and ‘unlocked’ smart phones, and in cluster C pupils were lent unlocked smart phones and sim cards, had it available in groups of two pupils only, and only for less than a day (p.5). The use of mobile phones covered different subjects as well as several mobile phone functions, presumable already before the project started (p.8). Although the project includes different approaches to mobile learning, a broad use of mobile phone functions as well as a huge range of activities by the pupils, the aspect of the pragmatic use (p.8; p.24) seems to be central for the teachers involved in this project (e.g. using the calculator in Maths or Physics, taking pictures to ensure ’scientific validity’, downloading podcasts to enhance foreign language skills, sending text messages with reminders for homework, accessing internet for gathering information etc. (pp.10f)). The use of mobile phones within the “How mobile phones help learning in secondary school” project applies to functions for communication, production, distribution and archiving – and is thus in one line with the other two projects “momo” and “Handy”: text messages, images, videos and upload possibilities to a convergent medium, a platform. But compared to the other two projects, here a wider range of functions is covered in situative and an assumed “appropriate” use in specific contexts. Text messages are used to send reminders to pupils, and to communicate with the teacher. Images, videos and sounds are used to record experiments for scientific validity and to store them for later recall. Capturing images is done by means of statements or comments, or to take visual notes instead of writing them down. Further on, the mobile device is used for the distribution and storage of learning material and to transport files for printing, as well as to store homework and download homework to the mobile phone, or to upload ideas, works or documentation of experiments to a web space. The PC as a further convergent medium was used for organisational/infrastructural purposes by means of producing time tables by using the alert function of the mobile phone in combination with the To Do list. Even if also here the documentation and storage affordances are covering a certain space, conversation and organisation are striking which are reaching into further dimensions of learning in terms of a discursive and conversational model of learning (see also Laurillard 2002, 2007), as well as the aspect of organisation and infrastructure as basic requirements for self-directed learning. Mobile phones are used as topics and as tools for learning, and the functions of the devices are usually not limited to the use of one function only. Preferred are the text, image, video and audio recording function. However, even if there is continuity for learning related to resources such as time, place, space and content, continuity is often missing in terms of the pupils’ cultural practices. Also, there seems to be a lack in the integration of some of the most original affordances which are characterising mobile learning: collaborative, conversational and situated meaning making. To adjust them in school contexts for learning and to scaffold the pupils’ meaning making process, it might be worth to consider the learner’s experiences with rules and regulations, and their ability to adjust and refine such rules and regulations situative and in social interaction – also related to the use of the everyday life device mobile phone in school contexts. Mobile learning in these three examples reverts to mobile phones as devices, and also the used functions and applications are similar. They are used with view to a specific curricular task, which is defined by the teacher in advance. And they often refer to a repository in form of a platform or a weblog in order to store material and have it available for later recall. With a view to the activities which are implemented in either the teacher’s instruction or the situation, the learners are either led, like in the MOMO example, or they are quite free to chose how to use the mobile devices like in the project by Hartnell-Young. One could also carefully assume that the didactic design is ranging between behaviourist learning on the one hand, and open education with elements of experimental and playful learning on the other. In more general terms, one could find mobile phones as considered to be either tools in a quite narrow sense, which is focusing on the transport of information, or that they are on the other hand focusing on the agencies and cultural practices of the learners as well as on situated learning and affordances. Re-contextualisation and situated negotiation: determined use or free space? A look at the functionalities (i.e. the affordances which are envisaged by using a specific function) within the three examples might give evidence to this “break” between the two contexts school and everyday life: the mobile phone tends to be a communicative device in terms of conversation in everyday life contexts of young people, whereas it is “re-contextualised” and becomes e.g. a device for documentation in school. One could say that such a shift might be negotiated in use (by means of Bakardjeva’s and Cook et al.’s notions of learner generated contexts). But one could also refer to the findings of the London Knowledge Lab and argue that the set of rules and regulations in school and for school learning might cause the children to act without allowing themselves to refer to notions of mobile phones which are related to fun and conversation. Conversation is indeed not as often used in m-learning settings as one would guess as the phone and text functions for the purpose of conversation are the most often used functions outside school. The exclusion of this typical everyday life use of the mobile phone marks not only a break between everyday life and school resp. a notion of “discontinuity”; it also points on the fact that communicative and discursive practices in the process of meaning making which are based on conversation are not the core issues in all m-learning projects. According to the drop out of conversation to the favour of documentation in some cases, convergent media such as platforms and Weblogs are used as repositories or archives; their relevance for information retrieval – which is one of the activities in which young people engage most often outside school – is not the dominant functionality in school. Instead, they host documents which were produced with the mobile phone, e.g. pictures, films or audio recordings etc. for reliability, sustainability and later recall. Under the light of the tendentious omission of conversation and information retrieval, one might assume that the meaning making process, the building of common and negotiated meanings and knowledge, is “outsourced” to a further medium[xiii], and as a consequence one could say that the immediacy and “ad hoc” notions of mobile devices are retarded, as well as that mobile phones serve as tools to capture immediacy or situations rather than enabling pupils to immediately access and generate situations and contexts. Such specific uses – ad hoc or at a later stage in the learning process – might be intended by the teacher who is setting the didactic design (e.g. with focus on content, context or affordances; see 1. ); or they might not be used by pupils because learners try to meet the requirements of school learning in terms of rules and regulations. However, an opportunity which is included is that all learners will have access to the learning material on a platform and are not depended on a situative success or failure of their current task. By referring to rules as linking structure between everyday life and school contexts, the focus is put on the dynamic dimension in the use of mobile phones in schools – which finally relativises the relevance of the question about a potential shift from ad-hoc to at a later stage. The underlying assumption is that rules are either set in advance and stable and predictable, or dynamically negotiated and changed according to a specific affordance. As the three examples aim to show, a regulated and pre-defined use of mobile phones and their functions is realised in m-learning projects as well as an open use which is based on situative negotiations and the use of the phone according to its situative affordance. The latter didactic design is the one which seems to be mostly open for a dynamic use of mobile phones by pupils, and which allows students to refer to their agentive and meaningful use of the tool, depending on the situation and on the assumed affordance. Further on, the examples might be able to show that the way how mobile phones are used in school are most often pre-defined by the teacher who is responsible for the didactic design of his classes, and thus an “open” and dynamic use might not always be possible – or even necessary. However, rules are considered to be constructs which are scaffolding a common context for learning and meaning making, which can also happen situated and spontaneous. Maybe commonly negotiated rules are structures which may successfully link school with the pupils’ life worlds. They contain the different meanings, experiences, intentions etc. of their constructors and are related to the agents’/ learners’ cultural practices, as well as their situative assumed affordance. Therefore didactic designs which offer spaces for teachers and pupils in order to negotiate on rules for e.g. the use of mobile phones would not only be a way to approach discursively to common meanings or to unfold the learners’ expertise, but also to accept and integrate subjective meanings and cultural practices into objectified and common ones. Alfred-Teves-Schule (2008): Schulwebseiten der Grund- und Hauptschule Alfred-Teves-Schule, Gifhorn. Gewaltprävention – Die Medien AG der Alfred-Teves-Schule. 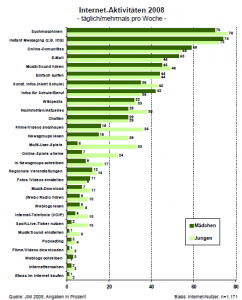 Online: http://www.alfred-teves-schule.de/schulwebseiten/de/Medien-AG/index.php, (Accessed: 31 August 2008). Becta: Becta. Leading next generation learning. Online: http://www.becta.org.uk, (Accessed: 10 August 2008). Bullying Online (2008): Bullying UK – Help us to support the UK’s children. Online: http://bullying.co.uk/, (Accessed: 28 August 2008). Deubelbeiss, Rolf (2007): Beispiel-Sammlung Projekt “Handy”. Online: http://metaportfolio-phsg.kaywa.ch, (Accessed: 10 August 2008). Deubelbeiss, Rolf (2008): http://klippundklar.blog.de. Online: http://klippundklar.blog.de/, (Accessed: 31 August 2008). ecmc GmbH innerhalb des Konsortiums klicksafe.de: klicksafe.de. Mehr Sicherheit im Internet durch Medienkompetenz. Online: http://www.klicksafe.de, (Accessed: 10 August 2008). 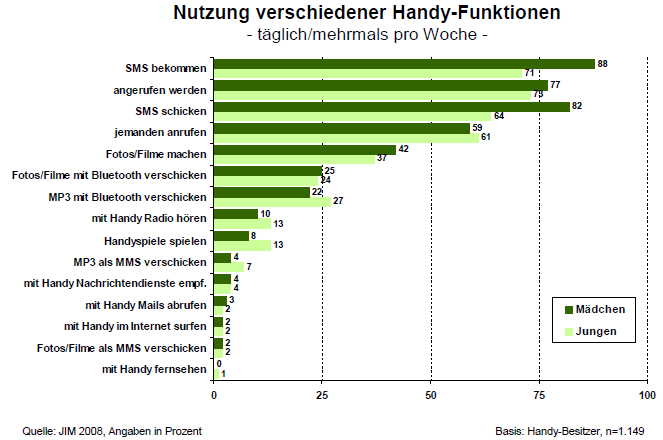 Finck, Norbert (2001): Mathematik-8: Projekt “Handy”. Lernsituation / Projekt “Gebühren und Tarife”. Online: http://members.aol.com/nfinckx/m8handy/m8handy.htm, (Accessed: 10 August 2008). Futurelab: Futurelab. Innovation in education. Online: http://www.futurelab.org.uk, (Accessed: 10 August 2008). International Association for Mobile Learning (IAMLearn): IAML – Mobile Learning. Online: http://mlearning.noe-kaleidoscope.org, (Accessed: 10 August 2008). Internet-ABC e.V. : Internet-ABC – Startseite. Online: http://internet-abc.ch/kinder, (Accessed: 10 August 2008). Kanton Zürich (2004): Gewalt und Pornografie auf dem Handy (E-Lesson). Kantonspolizei – Sicherheitsdirektion – Internet Kanton Zürich. Online: http://www.kapo.zh.ch/internet/ds/kapo/de/aktuell/E_Lesson.html, (Accessed: 10 August 2008). Landesanstalt für Medien Nordrhein-Westfalen (LfM); Medienpädagogischer Forschungsverbund Südwest (mpfs): handysektor. Online: http://www.handysektor.de/, (Accessed: 10 August 2008). London M-Learning Group (2008): London M-Learning Network. Hosted by the WLE – Centre for Excellence. Online: http://www.london-mlearning.net, (Accessed: 10 August 2008). lo-net GmbH: Lehrer-Online. Online: http://www.lehrer-online.de, (Accessed: 11 August 2008). Mobile Industry Crime Action Forum (2008): Out of Your Hands? Online: http://www.outofyourhands.com/, (Accessed: 28 August 2008). Österreichisches Institut für angewandte Telekommunikation (ÖIAT): Handywissen.at. Das Handy sicher und kostengünstig nutzen. Online: http://www.handywissen.at/, (Accessed: 10 August 2008). PhonepayPlus (2008): PHONEbrain. Online: http://www.phonebrain.org.uk/, (Accessed: 28 August 2008). Schittelkopf, Eduard (2007): Kurs: Spannung und Stromstärke. Online: http://moodle.mobileclassroom.at/moodle18/course/view.php?id=5, (Accessed: 31 August 2008); <http://www.mobileclassroom.at/moodle/course/view.php?id=23> (Accessed: 24 August 2007). Schweizer Fernsehen (SF) (2003): Dossier Handy. SF Wissen mySchool, SF 1. Online: http://www.sf.tv/sf1/myschool/detailinfo.php?docid=3193, (Accessed: 10 August 2008). Vadas, N.; Ellenberger, J.; Hollenstein, S. (2007): Dossier Handy. Webquest zum Film “Dossier Handy”. Online: http://edavs.educanet2.ch/handy/.ws_gen/, (Accessed: 10 August 2008). Arnedillo-Sánchez, Inmaculada (2008): The mobile digital narrative tool. IADIS International Conference Mobile Learning 2008. Bachmair, Ben (2004): Projekt www.Schulmedientauschbörse.de. Online: http://www.medienpaed-kassel.de/index.php?page=Forschung-Schulmedientauschboerse, (Accessed: 31 August 2008). Bachmair, Ben (2008): Topography of an ecological approach to m-learning in the context of global cultural transformation. Draft. Unpublished. 3 September 2008. Bakardjieva, Maria (2005): Internet society. The internet in everyday life. London: SAGE Publications. Bauer Media KG (Ed.) 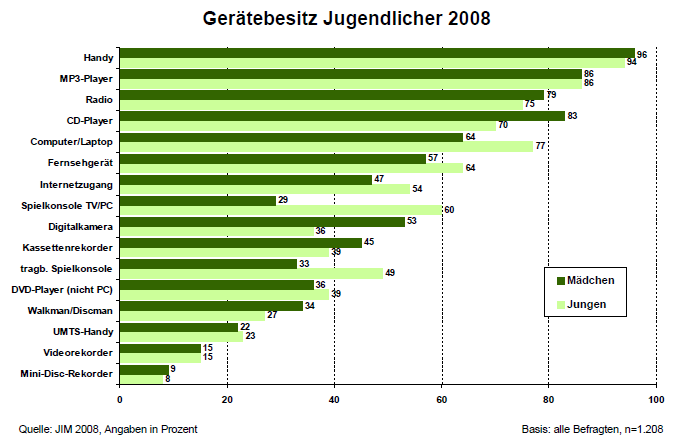 (2004): BRAVO Faktor Jugend 7: Marken und Trends. Online: http://www.bauermedia.com/fileadmin/user_upload/pdf/studien/zielgruppe/jugend/jugend7.pdf, (Accessed: 10 August 2008). Bauer Media KG (Ed.) 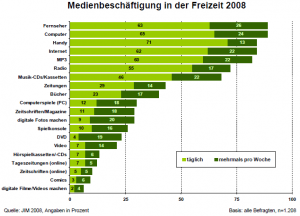 (2005): BRAVO Faktor Jugend 8: Now and Forever – Jugendliche Markenbeziehungen in der Retrospektive. Online: http://www.bauermedia.com/fileadmin/user_upload/pdf/studien/zielgruppe/jugend/jugend8.pdf, (Accessed: 10 August 2008). Bauer Media KG (Ed.) (2007): BRAVO Faktor Jugend 9: Jugend & Medienfreunde. Online: http://www.bauermedia.com/fileadmin/user_upload/pdf/studien/zielgruppe/jugend/Bravo_Faktor_Jugend_Brosch_re.pdf, (Accessed: 10 August 2008). Brynskov, Martin (2007): Tools for social construction: A framework for pervasive media for children. PhD dissertation. Aarhus. University of Aarhus, Faculty of Science. COMM/EAC (2008): EUROPA – Education and Training – Lifelong Learning. Online: http://ec.europa.eu/education/policies/lll/life/what_islll_en.html, (Accessed: 21 December 2008). Cook, John; Bradley, Claire; Lance, Justin; Smith, Carl; Haynes, Richard (2007): Generating learning contexts with mobile devices. In: Pachler, Norbert (Ed. ): Mobile learning – towards a research agenda. London: WLE Centre (Occasional Papers in Work-based Learning), pp. 55-74. Cranmer, Sue; Potter, John; Selwyn, Neil (2008): Learners and technology: 7-11. Edited by Becta. (Becta research reports). Online: http://partners.becta.org.uk/index.php?section=rh&catcode=_re_rp_02&rid=14837, (Accessed: 31 August 2008). Deubelbeiss, Rolf (2007): Das Handy an der NET. Verbote, Gebote, Lifestyle, Jugendkultur, Lernhilfe … ? Begleitbrief an Eltern. Nationale Elitesportschule Thurgau. Online: http://metaportfolio-phsg.kaywa.ch/files/Das%20Handy%20an%20der%20NET%20Begleitbrief.pdf, (Accessed: 10 August 2008). Div. ; Wikipedia (2008): Learner generated context. Online: http://en.wikipedia.org/wiki/Learner_generated_context, (Accessed: 15 September 2008). Dourish, Paul (2004): What we talk about when we talk about context. In: Personal and Ubiquitous Computing, Vol. 8, Issue 1, pp. 19‐30. Online: http://www.ics.uci.edu/~jpd/publications/2004/PUC2004-context.pdf, (Accessed: 10 August 2008). Featherstone, Mike (2006): Archive. In: Theory Culture and Society, Vol. 23, Issue 2, pp. 591‐597. Futurelab (2008): Enquiring Minds. Online: http://enquiringminds.org.uk/, (Accessed: 19 August 2008). Glotz, Peter; Bertschi, Stefan; Locke, Chris (2005): Thumb Culture: The Meaning Of Mobile Phones For Society. Bielefeld: Transcript. Hartnell-Young, Elizabeth; Heym, Nadja (2008): How mobile phones help learning in secondary schools. A report to Becta. Copyright University of Nottingham. Online: http://schools.becta.org.uk/upload-dir/downloads/page_documents/research/lsri_report.pdf, (Accessed: 31 August 2008). Hug, Theo (Ed.) (2007): Didactics of Microlearning. Concepts, Discourses and Examples. Münster/ New York/ Berlin/ München: Waxmann. Kress, Gunther; Leeuwen, Theo van (1996, 2006): Reading Images: The grammar of visual design. London: Routledge. Kukulska-Hulme, Agnes (2005): Introduction. In: Kukulska-Hulme, Agnes; Traxler, John (Eds. ): Mobile Learning. A Handbook for Educators and Trainers. New Edition. London, New York: Routledge (The Open and Flexible Learning Series), pp. 1-6. Kukulska-Hulme, Agnes; Traxler, John (Eds.) (2005): Mobile Learning. A Handbook for Educators and Trainers. New Edition. London, New York: Routledge (The Open and Flexible Learning Series). Laurillard, Diana (2002): Rethinking university teaching. A conversational framework for the effective use of learning technologies. 2. Edition. London: RoutledgeFalmer. Laurillard, Diana (2007): Pedagogical forms for mobile learning: framing research question. In: Pachler, Norbert (Ed. ): Mobile learning – towards a research agenda. London: WLE Centre (Occasional Papers in Work-based Learning), pp. 153-175. Ling, Richard (2008): New Tech, New Ties: How Mobile Communication Is Reshaping Social Cohesion? : MIT Press. Luckin, Rosemary; Du Boulay, Benedict; Smith, Hilary; Underwood, Joshua; Fitzpatrick, Geraldine; Holmberg, Joseph et al. (2005): Using Mobile Technology to Create Flexible Learning Contexts. In: Journal of Interactive Media in Education, Issue 22. Online: http://jime.open.ac.uk/2005/22/luckin-2005-22.pdf, (Accessed: 10 August 2008). Medienpädagogischer Forschungsverbund Südwest (mpfs) (Ed.) (2008): JIM 2008. Jugend, Information, (Multi-)Media. 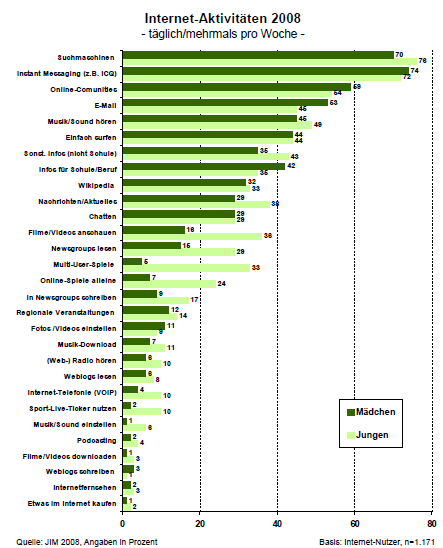 Basisstudie zum Medienumgang 12- bis 19-Jähriger. 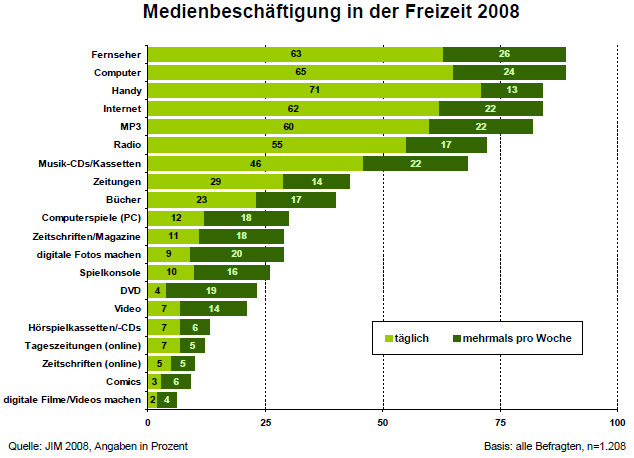 Online: http://mpfs.de/fileadmin/JIM-pdf08/JIM-Studie_2008.pdf, (Accessed: 21 December 2008). Naismith, Laura; Lonsdale, Peter; Vavoula, Giasemi; Sharples, Mike (2004): Literature Review in Mobile Technologies and Learning: Report 11. Bristol: Futurelab. Pachler, Norbert (2008): Mobiles Lernen: Spleen oder Paradigmenwechsel? In: E-Learning Dossier, Issue 3. Mobile Learning – eine neue Erfolgsstory. Online: http://www.elearning.zfh.ch/upload/Artikel_Pachler.pdf, (Accessed: 10 August 2008). Rummler, Klaus (2005): Realitätsnähe von Kinderfernsehprogrammen und geschlechterspezifische Fernsehnutzungspräferenzen. Magisterarbeit. Betreut von Ben Bachmair. Kassel. Universität Kassel. Online: http://kobra.bibliothek.uni-kassel.de/handle/urn:nbn:de:hebis:34-2007111519619, (Accessed: 31 August 2008). Schittelkopf, Eduard (2007): MobileClassRoom (MCR) – mobile online Learning (mLearning). Interview with Prof. Eduard Schittelkopf. Edited by nischiTV. Online: http://www.youtube.com/watch?v=zwgKnooEKlk, (Accessed: 31 August 2008). Schweizer, Herbert (2007): Soziologie der Kindheit. Verletzlicher Eigen-Sinn. Wiesbaden: VS Verlag für Sozialwissenschaften. Seipold, Judith (2005): Beobachtungen zur Dokugruppe „die rasenden Reporter“. In: Textor, Frauke (Ed. ): Schulmedientauschbörse – ein Projekt zur Nutzung des Internets in der Grundschule. Wissenschaftliche Hausarbeit zur Ersten Staatsprüfung für das Lehramt an Grundschulen. Seipold, Judith (2005): Fördert Fernsehen Medienkompetenz? Eine empirische Fernsehprogrammanalyse zum Angebot an Sendungen zur Medien- und Genrekompetenz. Supervised by Ben Bachmair. Kassel. Universität Kassel, Medienpädagogik Uni Kassel. Online: http://kobra.bibliothek.uni-kassel.de/handle/urn:nbn:de:hebis:34-2007111419602, (Accessed: 31 August 2008). 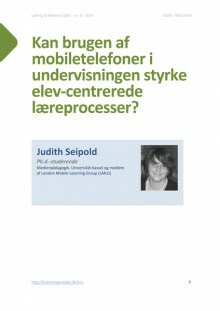 Seipold, Judith (2008): Mobile phones in school. Selected m-learning projects from Great Britain and the German speaking countries. In: Hug, Theo (Ed. ): Media, Knowledge & Education. Exploring new Spaces, Relations and Dynamics in Digital Media Ecologies. Innsbruck: Innsbruck University Press – iup . Shao, Yinjuan; Crook, Charles; Koleva, Boriana (2007): Designing a Mobile Group Blog to Support Cultural Learning. In: Norman, Austin; Pearce, Jon (Eds. ): Conference Proceedings. Long and Short Papers. mlearn 2007. 6th Annual International Conference on Mobile Learning. 16–19 October 2007. Melbourne: University of Melbourne . Sharples, Mike; Milrad, Marcelo; Arnedillo-Sánchez, Inmaculada; Vavoula, Giasemi (2007): Mobile Learning: Small devices, Big Issues: Technology Enhanced Learning: Principles and Products . Stald, Gitte (2007): Mobile identity: youth, identity, and mobile communication media. In: Buckingham, David (Ed. ): Youth, Identity, and Digital Media. Cambridge, MA: MIT Press . The Learner Generated Contexts Group (hosted by The London Knowledge Lab): Learner Generated Contexts. Online: http://learnergeneratedcontexts.pbwiki.com/, (Accessed: 15 September 2008). Traxler, John (2007): Defining, Discussing and Evaluating Mobile Learning: The moving finger writes and having writ… In: The International Review of Research in Open and Distance Learning, Vol. 8, Issue 2. Online: http://www.irrodl.org/index.php/irrodl/article/view/346/882, (Accessed: 03 September 2008). Walker, Kevin (2006): Mapping the Landscape of Mobile Learning. In: Sharples, Mike (Ed. ): Big issues in mobile learning . [i] The research of Bachmair, Pachler, Cook, Rummler and Seipold is related to the current book project of the London Mobile Learning Group (LMLG) (www.londonmobilelearning.net) which they are members of. “The group is working on a theoretical and conceptual framework for mobile learning around the notion of cultural ecology. The analytical engagement with mobile learning of the group takes the shape of a conceptual model in which educational uses of mobile technologies are viewed in ecological terms as part of a cultural and pedagogical context in transformation” (London Mobile Learning Group 2008). [ii] Approaches with focus on pupils’ everyday life (learning) and possibilities to integrate their cultural practices and cultural resources by means of their agencies into school are pursued by e.g. Futurelab’s project enquiring minds (www.enquiringminds.org.uk) or the project www.Schulmedientauschboerse.de (realised by the Media Education Unit of the University of Kassel. Bachmair 2004; Seipold 2005a, b, 2008; Rummler 2005). See also e.g. Cranmer et al. 2008; Brynskov 2007. [iii] For contemporary notions of context see also The Learner Generated Contexts Group 2008, and Div. & Wikipedia 2008. 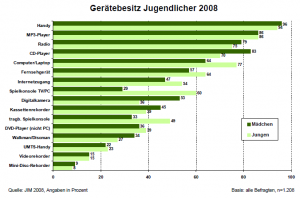 [iv] The figures with usage data are related to Germany and cover the group of the 12-19 year olds. [v] Besides: It might be useful to consider such usage data in case there might be a lack of infrastructural support to realise m-learning projects in school which means for the teacher to calculate without expenses, and thus to come back to the already available resources; e.g. the fact that the market share of mobiles phones ranges between 92% and 95% for the 12-19 year olds (MPFS 2007) plays to the use of the pupils’ own mobile phones in schools; the older the pupils get, the less necessary it is for teachers to provide devices; the fact that there are only few different brands preferred by young people between 12 and 19 should encourage teachers who dare to have a too large diversity amongst the pupils’ own mobile phones for projects in school – which might be an obstacle on the technological level, mainly to reach compatibility amongst the used media. [vi] The term ‘didactic’ is not used here in the English tradition implying excessive instructional direction and teacher-centredness, but in the German sense of referring to theoretical and practical considerations concerning teaching and learning. [viii] The project is technologically based on the “Mobile Learning Lösungen” MLE („Mobile Learning Engine“), and the moodle integration solution momo (“mobile Moodle”). Both solutions, MLE and momo, are available as open source under <http://sourceforge.net/projects/mobilemoodle/>. Accessed: 31 August 2008. [x] The teacher used for this theoretical part the „Dossier Handy“ from Swiss Television (Schweizer Fernsehen 2003), the website of the polie of the canton of Zurich (Kanton Zürich 2004) and a webquest which refers to both (Vadas & Ellenberger 2007). [xi] Microlearning can be described as miniaturisation, fragmentation and ‘elementarisation’ of learning material as well as short-term learning activities. Learning takes place here through an assembly of modular learning units by the learner (see e.g. Hug, 2007). [xii] Hartnell-Young & Heym 2008. [xiii] For knowledge building and meaning making by using Weblogs see e.g. Shao et al. 2007, for archives e.g. Featherstone 2006.